The hydraulic boat trailer of the SLW 3 AWS model is designed for transporting heavy load boats. The trailers are especially suitable for boat builders and other company`s that do need a heavy load boat trailer but because of the frequency of use don’t want to invest in real expensive solution. 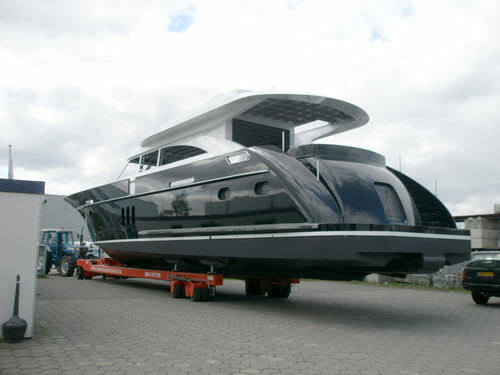 The trailer is designed to lift boats directly to the hull, by means of four or more (depending on the load capacity) hydraulic pads at the stern of the boat and a hydraulic lifting beam on the bow of the boat. Every pad is equipped with a gauge that are located at the controls for complete control when lifting the boat. The trailer is equipped with self leveling axels to make sure the stress levels on the hull are kept to a minimum. Also all the wheels are steerable witch makes precision position very easy. The trailer has to be pulled by an agricultural tractor or another suitable vehicle for example an airplane puller (for the loads over 100 tons). The trailer can be equipped with several options like an different front end, more wheels, different dimensions, and can also be adapted to your personal wishes. The trailers are very easy to handle and maintain and are economicly priced. Ask us for all possibilities.